Today I am sharing a favorite holiday recipe. This Gingerbread Cream Cheese Frosting is perfect for topping cupcakes for your holiday parties. 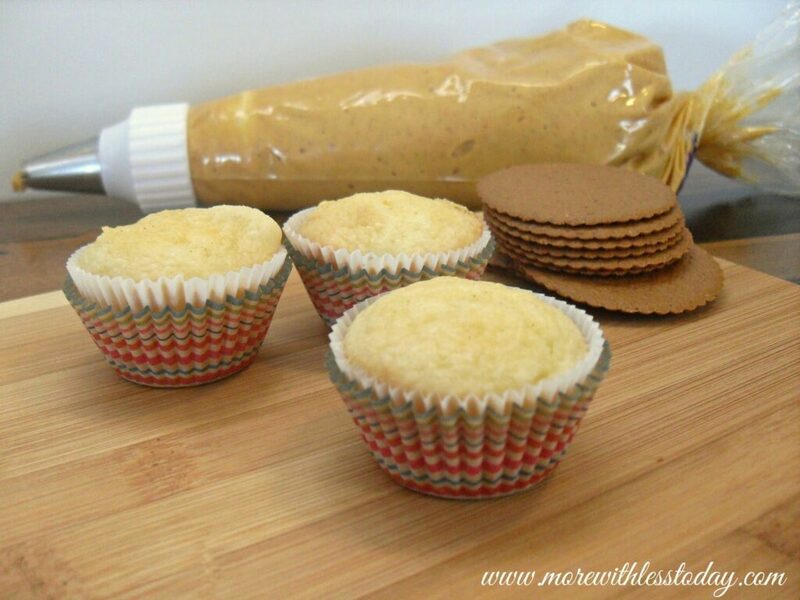 I’ve added thin, crisp ginger cookies for a simply beautiful decoration to these mini cupcakes. It’s a festive, edible cupcake topper! In the bowl of a stand mixer combine the softened cream cheese, the butter, vanilla, molasses, and brown sugar. Sift together the powdered sugar, cinnamon, and nutmeg. Gradually add the sugar and spices to the cream cheese mixture and mix on high until smooth. If the mixture is too stiff you can add a tsp to a time of water or milk until the frosting is the right consistency for piping. Pipe onto your favorite cupcake and enjoy! To decorate these simple cupcakes, fill a large piping bag with the Gingerbread Cream Cheese Frosting and fit it with a large tip. Pipe a generous amount of frosting on each cupcake. 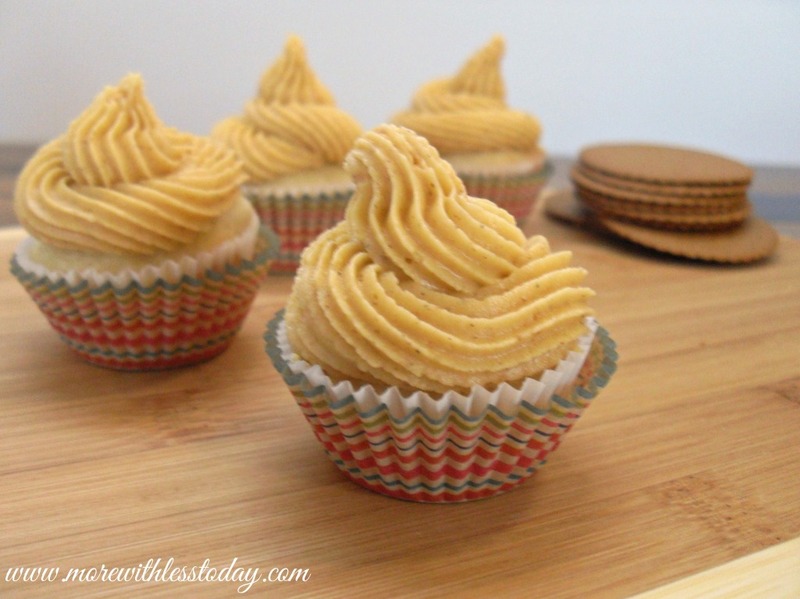 I found some very thin, crisp ginger cookies at the local market and thought they would be a really fun addition to my holiday cupcakes. I used white icing to pipe words like “peace”, “joy”, “merry”, and other holiday phrases onto the ginger cookies. When the icing was dry I placed one into the cream cheese frosting on top of each cupcake. 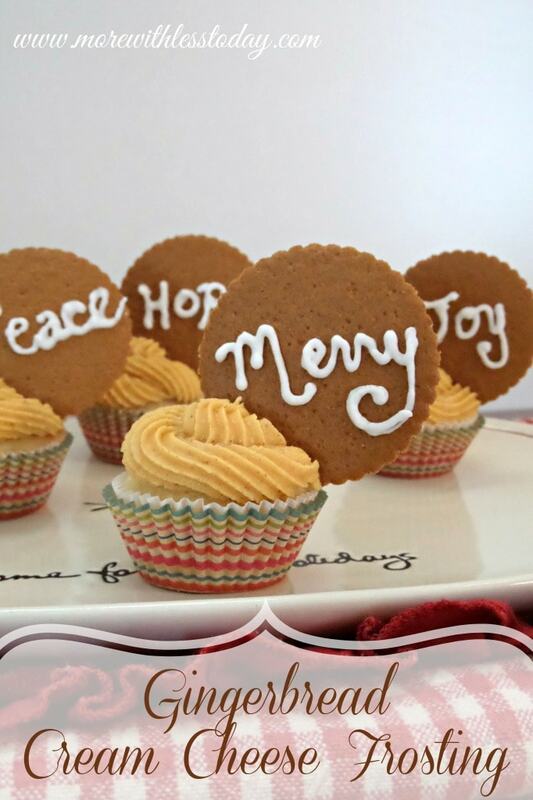 When you share these cupcakes at the next holiday get together everyone will love the gingerbread flavor and the festive cookie cupcake toppers! Do you have a favorite holiday flavor you like to incorporate into your baking recipes?